The current state of the toilets on campus hasn’t changed since they had first been installed. Our plan is to implement dual flush toilets on campus. The current toilets on campus may use up to 7 gallons of water per flush while dual flush toilets only use 3 liters of water for liquid waste and 6 liters for solid waste. A major part of the reason many institutions don’t convert to low flow or dual flush toilets is due to the fact that their older, more wasteful versions are already fully functional and do not need to be changed. The cost of dual flush toilets is also a bit off putting with their least expensive being $94 and the most expensive at $416. We want to implement dual flush toilets on campus; in the dorms and in all buildings. We have approximately 150 toilets in the dorms. Let’s say that each student uses the toilet 3 times a day. That is 24,975 gallons of wasted water every single day. According to the same statistics, if dual flush toilets are initiated in just the dorms, we would use 6,393 gallons of water per day. That is 18,582 gallons of water saved. 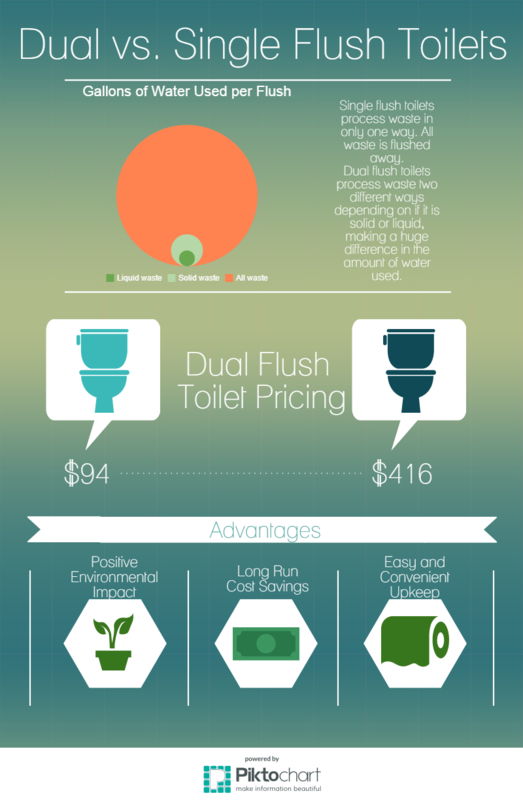 Changing over to dual flush toilets would save an incredible amount of water, but it is also pricey. If we bought the least expensive toilets at $94 a piece with installation rates covered, the overall cost would be $14,000 dollars. This is a large investment for the dorms alone, but after about a year of savings on the water bill, we would make back about $13,500, which almost covers the initial cost. The time to change is now. The drought here in Southern California is beyond severe, and we need to take matters into our own hands. Implementing low flow or dual flush toilets would be a huge step towards a more sustainable Whittier College. Elliot, Sara. “How Dual Flush Toilets Work.” How Stuff Works. Infospace LLC, 11 Nov. 2008. Web. 10 Dec. 2015. Moloney, Claire. “Payback Period for Low Flow Toilets: Is the Cost Offset by the Water Savings?” Popular Network. POPULAR, 2014. Web. 15 Dec. 2015. “Niagara Toilet Fill Cycle Diverter.” Conservation Mart. Niagara Conservation, 2008. Web. 15 Dec. 2015. “Toilet Tank Bank – Save Water with Every Flush.” ConservationWarehouse. Solid Cactus, 2015. Web. 15 Dec. 2015.